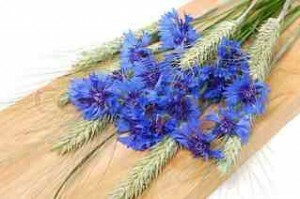 Great Aunty Gethsemane used to keep a bunch of twenty seven dried Blue Boy Cornflowers hanging in every room of the house. She said it stopped the poltergeists interfering with her drawers. Why Dry Cornflowers Mr Higgledy? Dried cornflowers keep their colour really rather well…and there is something…’farmhousey’ and comforting about a bunch of hanging cornflowers. Also if you grow your own you may find you have a glut that you can’t use…especially if you are a miserable old sod with no friends. So drying will give you flowers for the winter when most British blooms are a fading memory. Be warned my darling young friends…it’s not a case of just hangin’ em upside down…not quite anyway…. *The trick is to catch the flowers at the correct stage of blooming…this is when the center petals are still pointing into the middle…rather than the later stage when they will be pointing away from the center…probably to the naughty poltergeists. *Don’t harvest them in the morning…wait until the dew has dried. *You can still dry these later blooming chaps but they are better as confetti or even sprinkled over upper middle class salads….dry these in a box as petals will naturally come away from the plant. This one is good for confetti…note petals are fully open. *So…take about 20 stems of roughly the same length and tie them with an elastic band or string and hang them somewhere DRY and DARK…spooky spooky woo. *In the summer I use my mate Pete’s garden shed and they take about two weeks or so to dry. *For a more contemporary vibe, try drying with Zinnias and lavender…we will be doing this later in the season…that’s how rock and roll we are. Needless to say you can find cornflower seeds in the Higgledy Garden Shop…still plenty of time to sow for this season. Is it too late to sow Flower Seeds? Mr Higgledy To The Rescue. I have been trying to dry cornflowers but ended up with stripy colour. I shall give it another go with your instructions. Best of luck! …make sure they stay cool…..
Year after year I try to dry flowers – this advice might be the extra clue I need! An tips for larkspur? I have never tried larkspur…but I suspect that the same rules apply…I shall try some this season. 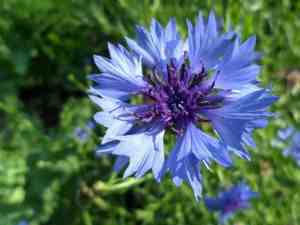 I am totally addicted to Cornflowers and am the proud owner of a large, self sown, circle of ‘blue boy’ which my 2 little sons and I had sewn back in Feb!!! Thank you , thank you….as i now have the know-how to dry them. Rock On!!! 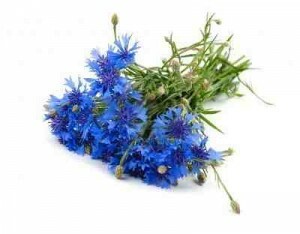 Blue cornflowers were the first seeds I ever grew, aged 5. I adore them. It’s nice to see you promoting zinnias too. My granny used them as companion plants in the vegetable gardens. It was a glorious sight… so many bright flowers! Keep up the good work!